Women’s Tennis Wins Against Mules | The Gettysburgian. 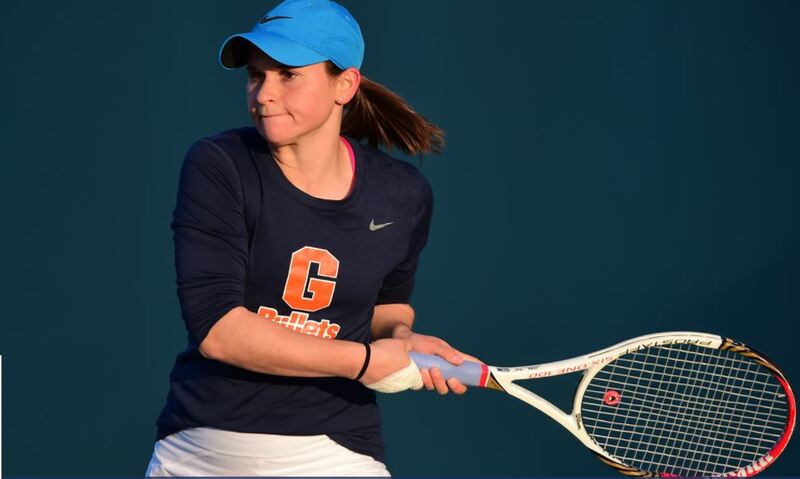 The Gettysburg College women’s tennis team swept Centennial Conference rival Muhlenberg College 9-0 Saturday. This victory was the fourth for the Lady Bullets this season, making their overall record 4-8 and conference record 3-3. The Bullets are currently tied for sixth in the Centennial Conference alongside Dickinson College. Gettysburg started the day strong in the doubles section of the contest. In the third doubles competition, senior Erin Sweeney and first-year Shaye Barnes worked together to produce an 8-0 sweep. The second-doubles match also showcased a dominant performance for the Bullets. Juniors Maria Martinovic and Maddie Class took the win 8-1. Rounding out in first doubles was sophomore Samantha Boardman and junior Amanda Vinges with an 8-2 victory. The underclassmen duo in the number one doubles slot this season have proven a strong rookie season. When it came to the singles competition later in the day, the momentum continued in the Bullets’ favor. Martinovic returned to the court to claim another victory in the number-one seed slot with a 6-1 6-4 victory. She is currently ranked eighth in the Conference for singles. Boardman also won again at the number-two slot. Losing only two total games, Boardman came in with a 6-0 6-2 victory. Vinges defeated junior opponent Jourdyn Buckheit 6-1 6-1 in third singles. Class was well on her way to another victory in fourth singles with only one loss in the first set before her opponent retired in the middle of the second set. Sweeney won the fifth single set 8-6 before first year Samantha Anastasiou completed the sweep with an 8-3 win in the sixth. The 9-0 victory boosted the Lady Bullets’ confidence as the team advances through a tough conference schedule. The Bullets face three more Conference teams before the season concludes at the end of the month. The women’s tennis team will continue their season at out-of-conference competitor Washington College Saturday at 1 p.m. They will compete at home at 4 p.m. against rival Dickinson College, before facing three more conference foes to end the season.